Walter made a distinct impression on people. Singers loved him. In fact, everyone who met him did. 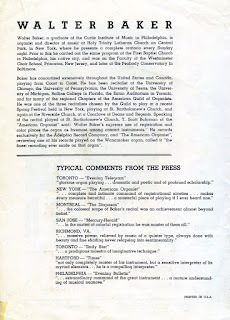 Jonathan, who took care of Walter in the last years of his life, and inculcated his mentor's teachings, wrote the following article in The American Organist (May 1989) which gives the reader the scope of Walter's huge presence, both artistic and personal. 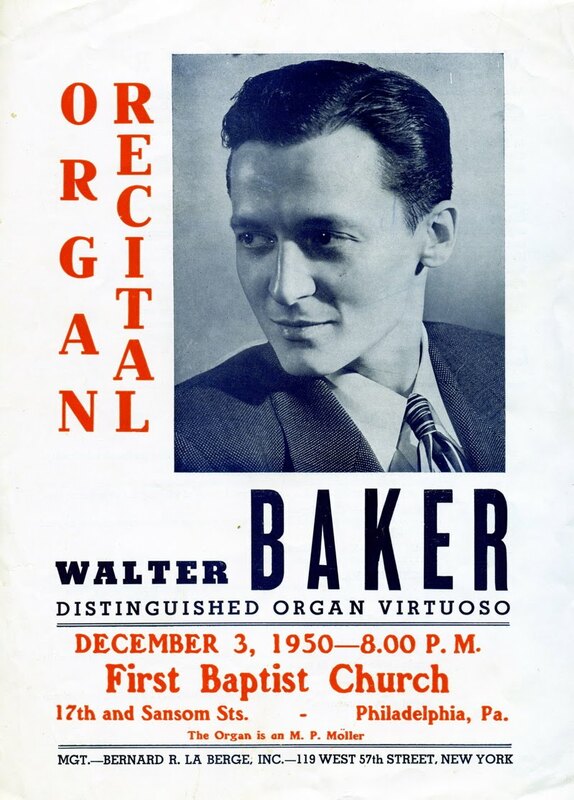 As with all great musicians who achieve major career, Walter Baker was a child prodigy. After beginning piano lessons at the age of six, he soon turned his sights to the organ. By the age of nine he was playing church services regularly, and he acquired his first church position, the Patterson Church, when he was twelve. At this same time, he became a regular feature on the weekly Al Hoxie radio show, as both organist and pianist. (During the next 25 years he was to perform extensively for WACU radio in Philadelphia.) Becoming organist for the Ruby Theatre in Philadelphia when we was 15 (this was still very much the era of silent motion pictures), he was also performing with his successful, popular band, "Walt Baker and His Varsity Six," which provided additional income for his family. After spending a year (1927-28) in San Francisco training and working as a semi-professional boxer (managed by his older brother), Walter returned to Philadelphia and began organ study with Alexander McCurdy at the Curtis Institute, from which he graduated in 1938. "There is, and always will be, only one Walter Baker: he is completely unique," McCurdy was to repeat often through the years. The pupil-teacher relationship was to prove mutually advantageous. Walter was not only McCurdy's first important pupil at Curtis, but in the early decades of his career, his most successful. McCurdy worked vigorously to lay the foundation of Walter Baker's career, not only by instruction but by introducing him to many world-famous musicians and organbuilders, such as Ernst M. Skinner, M. P. Möller, Marcel Dupré, Joseph Bonnet and Leopold Stokowski. Walter Baker had listened to Lynnwood Farnum several times in the last two years of Farnum's life and maintained that he was without equal technically or musically as an interpretive organist. Through McCurdy, who was Farnum's pupil, he was to absorb, develop and, finally, embody what is now generally described as the American Romantic school of organ playing. Walter Baker had by this time won an appointment to the First Baptist Church of Philadelphia (1934-48), at the time a focal point of wealth and prestige. There, his Oratorio Society presented every major work in the repertoire, making the church a focal point of musical activity as well. The position at the First Baptist Church, which Baker gained when he was 24, may be said to have been his first major "break." The second was two years later when at 26 he was included in the management of Bernard La Berge. Alexander McCurdy, well aware of the caliber of his pupil's development, persuaded La Berge to travel to Philadelphia to meet Walter Baker and hear him play. Walter's secure musicianship, brilliant technique and command of the organ's tonal resources were not all that the shrewd La Berge found: Walter's astonishing good looks, combined with his boldly romantic and charismatic personality, were a concert manager's dream come true. Walter's instant and continuing success with the public won him repeated tours for the next 20 years. He suave appearance, sonorous speaking voice, awesome projection of personality and intensely poetic interpretations were to render him a unique image in the public's imagination. During the long tenure of Mary Vogt as musical director of the Wanamaker Store in Philadelphia, over 400 recitals were given there by Walter Baker. 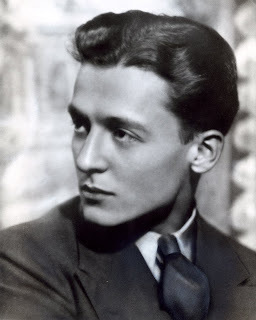 It was in the store's Grand Court that he conducted the world's first televised performance of Wagner's Parisfal, with the Philadephia orchestra and a chorus of 300, on Good Friday, 1948. From 1948 to 1951, Baker worked as assistant conductor to Dimitri Mitropoulos at Philadelphia's Robin Hood Dell and with the New York Philharmonic. He also served as organist of Holy Trinity Lutheran Church in New York City (1949-59). His constant church work, recital tours and conducting left little time for his teaching appointments at Westminster Choir College, Peabody Conservatory of Music, and the Mannes College of Music. Without a doubt, his most successful pupil was the late Thomas Schippers, who wrote of Walter, "He is one of the few genuinely great musicians of our time." 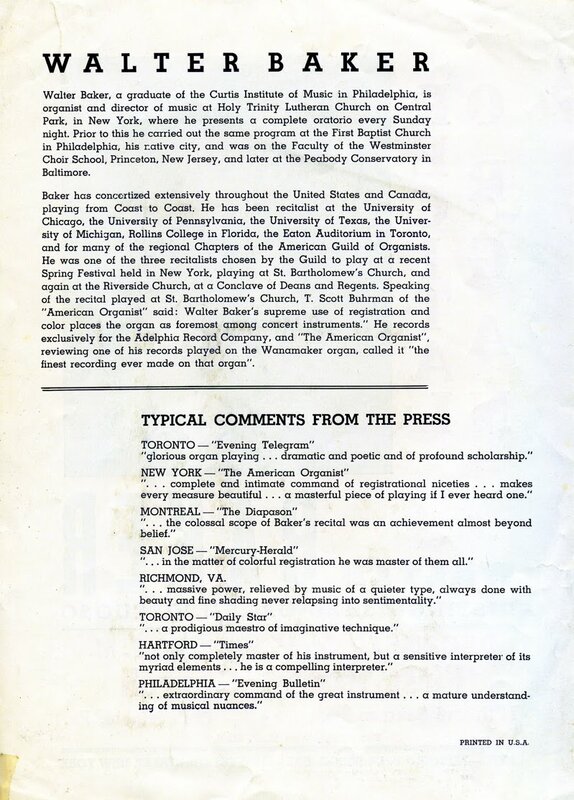 Schippers had Baker prepare and direct the choirs for the world premieres of Menotti's The Unicorn, The Gorgon and the Manticore and Poulenc's Sept répons des ténèbres, the latter commissioned for the opening of Philharmonic Hall at New York's Lincoln Center. It was, however, as a concert organist that Walter Baker achieved his widest recognition. From 1936 to 1957, in tour after tour, he brought a glamour and passion to the concert stage that had not been associated with organ recitals before. His profound and electrifying interpretations of Reubke, Liszt and Reger ignited the imagination and set a performance standard for an entire generation of organists, now in their 40's and 50's. Walter Baker's astonishing invention, indeed genius, for color has been much written about and commented upon. This was most fully revealed in his startling conceptions of now seldom-heard showpieces- Karg-Elert's Pastels from Lake Constance, Paul de Malengreaue's Le Tumulte au prétoire and Daniel-Lesur's Scéne de la Passion, to name a few examples. 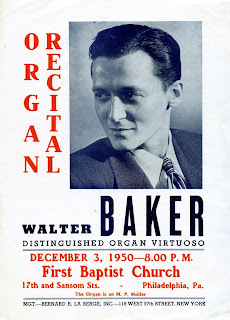 Not only publicists and concert agents, but rank-and-file organists across the county still use the term "legendary" and "giant" to describe Walter Baker. Even during the last 20 years of his life, when stroke after stroke robbed him of his phenomenal technique and coordination (though not his vitality and style), the aura and mystique still hung heavily on him. And perhaps that is the word: personality. For it was Walter Baker's personality that engulfed his art with a volcanic emotional power, a childlike wonder and a sheer scope of vision that was able to stun audiences and confound standard criticism. The smoldering look in Walter's 1939 headshot was captured after the photographer intentionally insulted the great organist. He certainly got it. Hello! Very interested in this talented man, but there is absolutely no information, only your article. Could you share with me some facts or at least some photos? I can throw your email. Would be very grateful! Best wishes, Maria.